So you're starting to dance and thinking about costuming? - Here are some hints to help you, and many of these will make - costuming a bit less expensive. 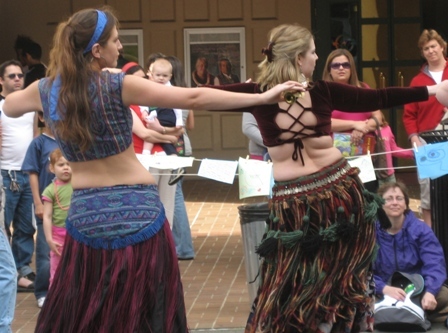 Dance Styles and Costumes From Tribal to Cabaret - a great source of info, with pictures! Compiled by Zatarra. When it comes to costuming, it's a good idea to have a 'swatch bag' with samples of fabrics from costumes you already own. That way you can match colors when you buy or make items. Be sure to collect "stuff" in your favorite colors. If you're just starting out, pick one or two colors you like and either gold or silver as your accent. Buttons - some are really pretty. - Button covers, too! Beads - of course, all sizes! Christmas wrappings and decorations - the ribbons for packages can be used in many ways - if it's a color you like, you can probably use it! Earrings/Broaches - - broken or not, pieces missing or not - if you've lost and earring, don't toss the other one out, add it to a costume! Jewelry - broken chains - you can make great tassels to add to costume pieces with fine chains. - Larger chains are great on belts and other ways, too. Glitter - anything that glitters or shines! Holiday Garlands - beaded are great - whole costumes can be made by cutting and/or draping these plastic beads. Yarn, Embroidery Thread, Crochet Cotton - these are all useful in making tassels and decorating costume pieces. Puff Paint - you can do some cool stuff with it. Palettes and Sequins - of course! Fabric - it doesn't have to be a large piece to be of use. 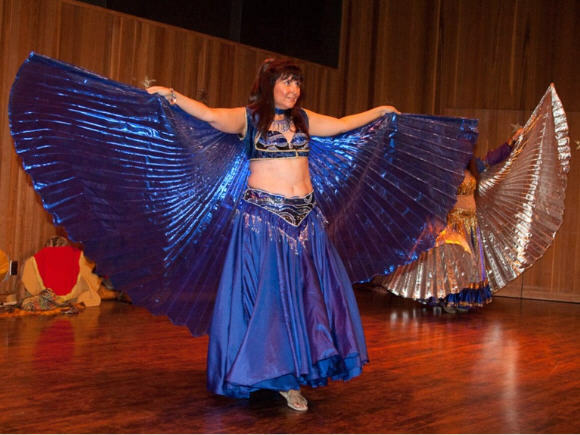 If you're in the Olympia area, remember that Mas Uda has for many years had occasional fun costuming evenings, so contact Kashani to see when the next one is planned or to just get together and get some help with costuming - she and her 'dance mates' can help you out. Those who perform with - Mas Uda - must have a full skirt, pants, bra (or peasant blouse) and belt combo that all work together, as soon as possible - there are a few items for sale at the studio and members can help you putting an outfit together until you can come up with your own. - PLUS, we may have a set in the troupe costuming "closet" that can be assigned to you. 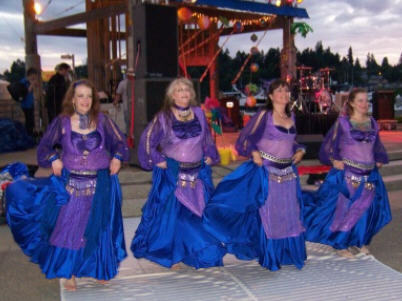 The troupe (and Kashani) can loan you some things to start with, but you should plan on getting one complete outfit to start dancing with the troupe. Other items to think about 'adding to' your basic costume - vest, ghawazee coat, accent skirt, peasant blouse, skirts and pants of additional colors. - These can be easily made, and help is available. You may want a print fabric that has 'YOUR' colors in it and use that fabric as a basis for selecting other stuff to go with it. We have Mas Uda 'costuming consultants' - they can help you and so can - Kashani. 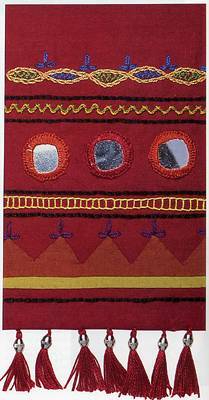 Shisha is a type of embriodery which attaches small pieces of mirrors to fabric. From May, 2015 Sahda dance newsletter (article by Lady Ra) -"Mirrorwork called Shisha, stems from old Islamic tradition. Mirrors on clothing and belongings are said to deflect the Evil Eye in three ways: trapping the Evil Eye and holding it's reflection for eternity, reflecting the Eye and away from the wearer and blinding, or at least distracting, the Eye with its brilliance so that the wearer remains unharmed." For directions on how to make shisha click here.